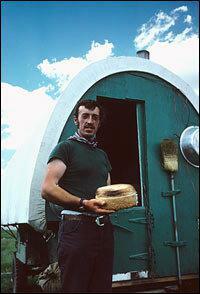 A herder holds freshly baked bread outside his wagon. The sheepwagon is a camp on wheels with beds, a table, and a wood stove. It was pulled in the early days by a team of horses and later by a pickup. 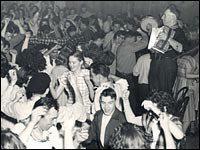 An accordionist leads his band at the annual Sheepherders Ball. The Basque boarding house was a meeting and resting place for herders who had no other home. Meals were served family style and the owners often would do what they could to help the young men adapt to life in the United States. The Sheepherder's Ball was the highlight of the year in Boise. The men wore denim, the women wore simple house dresses. Lambs were auctioned off and proceeds given to a charity. Huge platters of chorizo and stew and pork sandwiches were served. The ball continues to this day every December at the Euzkaldunak Club's Basque Center and on today's Idaho Matters, The Kitchen Sisters visit this tradition.